Found this while digging through my collection of minicomics. 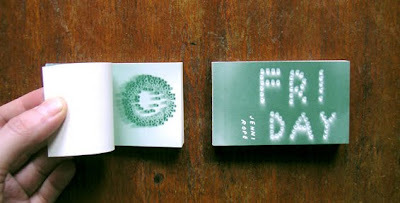 Friday by Jenni Rope (Napa Books, 2005) is a small (3.5" x 2") book is a flipbook of abstract imagery. 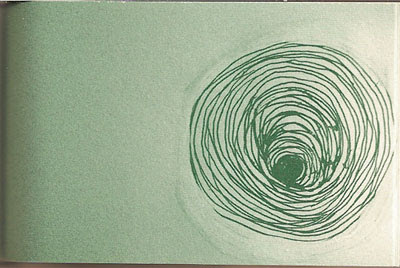 Like many abstract comics, it is sequence of transformation, expansion and contraction. From nothing, a bunch of beadlike objects slowly grow into a pattern, then they are encircled by lines. The beads slowly disappear and the lines between a dark circle which then shrinks into non-existence. 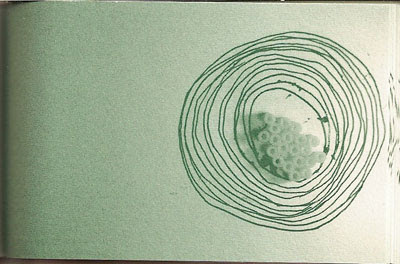 Here's an image from Rope's website and two more that I scanned in. The flipbook format is an interesting comics/animation variant. Is it one or the other? A bit of both?